25 cm x, 269 p. : ill. 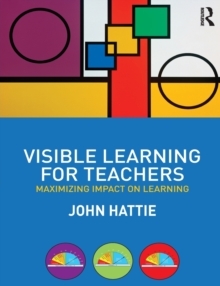 In November 2008, John Hattie's ground-breaking book Visible Learning synthesised the results of more than fifteen years research involving millions of students and represented the biggest ever collection of evidence-based research into what actually works in schools to improve learning. Visible Learning for Teachers takes the next step and brings those ground breaking concepts to a completely new audience. Written for students, pre-service and in-service teachers, it explains how to apply the principles of Visible Learning to any classroom anywhere in the world. The author offers concise and user-friendly summaries of the most successful interventions and offers practical step-by-step guidance to the successful implementation of visible learning and visible teaching in the classroom.